The Pacific flatheaded borer has been a serious pest throughout the United States and southern Canada in the past but is rarely seen in commercial orchards. It attacks many trees and shrubs. The larvae kill or weaken trees by girdling the trunks and lower branches. Stressed plants are most vulnerable. Newly planted nursery stock, drought stressed trees, sunburned trees and trees whose trunks are exposed to the sun usually are the most seriously affected. One borer can kill or severely weaken a small tree. The borer attacks apple, pear, peach, apricot, plum, prune and cherry as well as many other trees and shrubs. The egg is pale yellow, disk shaped and wrinkled, and is about 1/20 inch (1 mm) in diameter. The larva is a yellowish white, slender grub, which can grow up to 1 inch (25 mm) long. The front part of the body is broad and flat, prompting the insect’s common name of flatheaded borer. The larva usually lies curled on one side in a U shape. The pupa is about 1/2 inch (13 mm) long. It is pale yellow at first but later turns brown. The adult is a broad, flat beetle about 1/4 to 1/2 inch (6 to 13 mm) long. It is brown with irregular grey markings and has a coppery luster. Its back beneath the wing covers is brilliant green. Adults emerge soon after bloom of apple. Females lay eggs from early June through July in crevices in the bark, usually on the sunny side of tree trunks below the lowest branches. Females prefer to lay eggs on sickly, dying or recently transplanted trees. 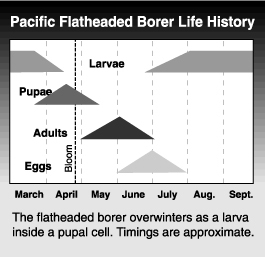 The eggs hatch from mid-June to mid-August. Newly hatched grubs burrow into the bark and feed between the bark and sapwood until full grown. If the tree is vigorous and full of sap, the borer cannot thrive within the growing tissue and it may die or stop growing. When mature, the grubs burrow a short distance into the wood and build cells where they overwinter and pupate in the spring. The adults’ emergence holes in the bark or exposed wood are oval and about 1/4 inch in diameter and are usually near the base of the tree. The burrows are broad and irregular. The wound can encircle and kill a young tree, but on larger trees the injury is usually confined to the sunny side. The grubs throw out very little frass. Injured spots can be detected by a dark colored depression in the bark and by cracks in the bark through which the frass shows. Birds, such as woodpeckers, peck the larvae from the trees with their sharp beaks. Carpenter ants will eat both larvae and pupae while they are in the wood. Hymenopterous parasites also attack the borer. Because the borer attacks mainly weakened or injured trees, the best way to prevent infestations is to keep trees healthy and vigorous. To prevent sunburn, paint the trunk with a mixture of white latex paint and water. Keeping weeds, grass and trash away from the base of the trees makes it easier to detect and remove borers and exposes them to natural enemies such as birds. Where possible, remove wild host plants, such as hawthorn, shadbush, mountain ash and wild apple seedlings that are near the orchard. Larvae cannot be controlled after they have entered the bark so the best strategy is to prevent egg laying. As the adults only lay eggs in direct sun on the trunk below the branches, barriers or sun shades will help to stop egg laying. Use loose paper or another type of tree protector. Wrap the trunk loosely with paper, cloth or burlap. Paper should be water resistant and resilient enough to allow for trunk growth. 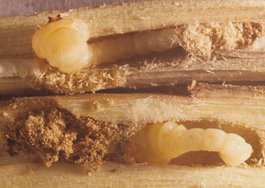 Insecticide applications should be timed to kill newly hatched larvae before they enter the bark. Residues must remain on the trunk during egg hatching. Spray the trunk up to the lower limbs about June 1 and again on July 1.